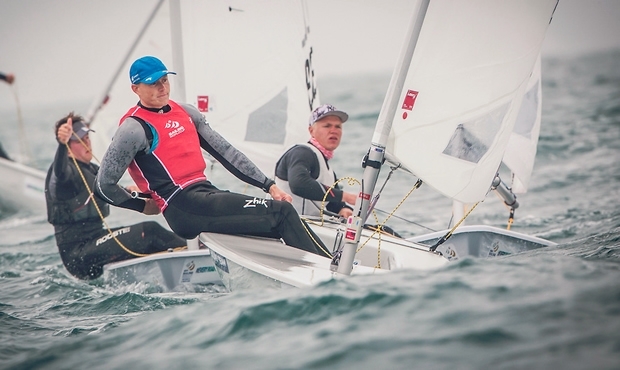 With 10 knots of breeze that steadily died during the day, tide that was taking the boats over the line and a mist that often made it hard to see the next mark, it was challenging opening day of racing for the Lasers and Laser Radials at the Sailing World Cup Weymouth and Portland regatta. And Thursday’s racing followed an opening day when all but the 49ers, FXes and RS:Xes were kept ashore due to a lack of breeze. Defying the forecast, this morning conditions looked much more promising with the wind into the teens, but also with a stubborn fog. The wind held until about the time the boats began to launch ready for their 1100 start, when it began to drop off slowly. Man of the moment in the Lasers is Britain’s own Nick Thompson. Following a strong legacy in the singlehander - following Ben Ainslie’s silver and gold in 1996 and 2000 and then Paul Goodison’s gold in China in 2008 - Thompson heads into Rio 2016 coming off the back of two World Championship wins. This may not be Giles Scott’s, or the Aussie 470 Men’s or Billy Besson’s four back-to-back wins, but it is nonetheless a solid, welcome track record. Coming from the British Sailing Team and a background of Ainslie and Goodson, surely there must be some legacy within the team for their Laser star of the moment? But in fact, since Thompson was previously Paul Goodison’s long term sparring partner, little has changed now that he is top dog. Nonetheless when Thompson isn’t at events, he is training in the UK with the GBR squad. Once again the team’s long term Laser coach, Chris Gowers, the man behind Goodison’s gold in China and the three world championship victories notched up between Goodison and Thompson, is continuing to keep a firm hand on the British Laser squad rudder. As to the Laser racing there, Thompson says the class has considerable depth at present. While he might be considered favourite, there is also the likes of Olympic legend, Brazilian Robert Scheidt, who will hold home team advantage. Then there are the likes to Germany’s Philipp Buhl, Jesper Stalheim from Sweden, Sam Meech and Australian Tom Burton, today’s winner in Weymouth. Today conditions on Weymouth Bay were tricky for both competitors and race officials alike. The Laser Radials for example only got away on race one on their fourth attempt in and the build-up to race two was worse for both classes. With tide pushing boats over the line, it was difficult to set the start line and often there were general recalls or rehoisting of the AP. Thompson personally wasn’t happy with his starting today but managed to post a 4-11-5 with the middle score being his discard. He finished the day fifth with Tom Burton leading and with team mate Elliot Hansen holding second after winning the opening race. Racing continues tomorrow with the race committee still attempting to make up for day one’s lost races.